We love roasted vegetables and are always looking for new ways to spruce them up. 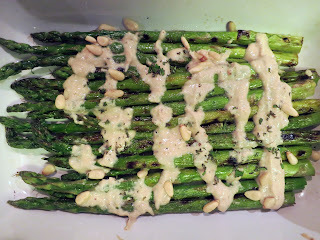 On this occasion, I found a recipe in my new cookbook, Spork Fed , by Jenny Engel and Heather Goldberg for grilled asparagus with an herb pine nut sauce that sounded great. So, we took a chance and it turned out as great as it sounded. Start by making the sauce. To begin, dry roast pine nuts in a saucepan over medium-low heat until lightly browned and fragrant. Remove and place in a high-powered blender or food processor. Add oil, soy milk, sea salt, black pepper, lemon juice and zest, and roasted garlic. Blend until smooth. Fold in chopped herbs while reserving some for garnish. Set aside until ready to use. Heat a grill pan over medium heat and drizzle asparagus with oil. Place asparagus on grill and cook for about 3 minutes, or until grill marks appear. Flip and grill on other side. Sprinkle with sea salt and lemon juice. To serve, drizzle sauce over asparagus and enjoy!